SEB has published its first Green Bond Investor Report, describing the environmental impact from SEB’s inaugural green bond, issued in February 2017. SEB has used proceeds from the 4.9 billion Swedish kronor (500 million euros) bond to grant green loans for environmental projects within for example renewable energy, sustainable forestry, green buildings and clean transportation in Sweden, Norway and Finland. "We are convinced that green financing solutions are key in developing a sustainable society. We will continue to support our customers and intend to further develop and expand sustainable financing in the next few years", says Joachim Alpen, Co-head of Large Corporates & Financial Institutions. Alpen says SEB needs to further develop both systems and processes in order to enable further penetration of green assets into the bank's products and services. SEB was a key partner when the World Bank issued its first green bond for institutional investors in 2008, and the bank has been a leader in the development of the global market for green bonds ever since. Today, SEB is a global sustainable finance specialist and advisor. To date, SEB has facilitated the issuance of green bonds at a total value of 17.7 billion dollars. 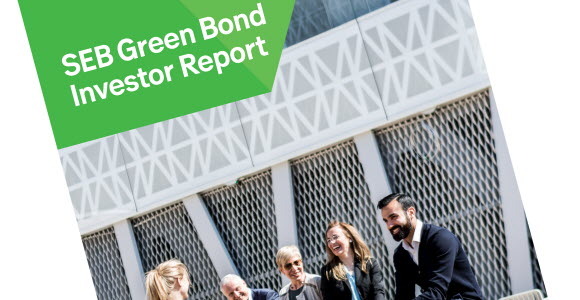 The new Green Bond Investor Report describes the environmental impact of SEB's own green bond, for example, how the proceeds were distributed among categories, energy savings and CO2 reduction. In 2017, projects that received financing through the bank's green bond helped reduce CO2 emissions by close to 220,200 tonnes. This corresponds to emissions from around 140,000 cars running an average distance of 12,000 kilometres per year. The report also illustrates how SEB's green bond is aligned with UN's Sustainable Development Goals (SDG).